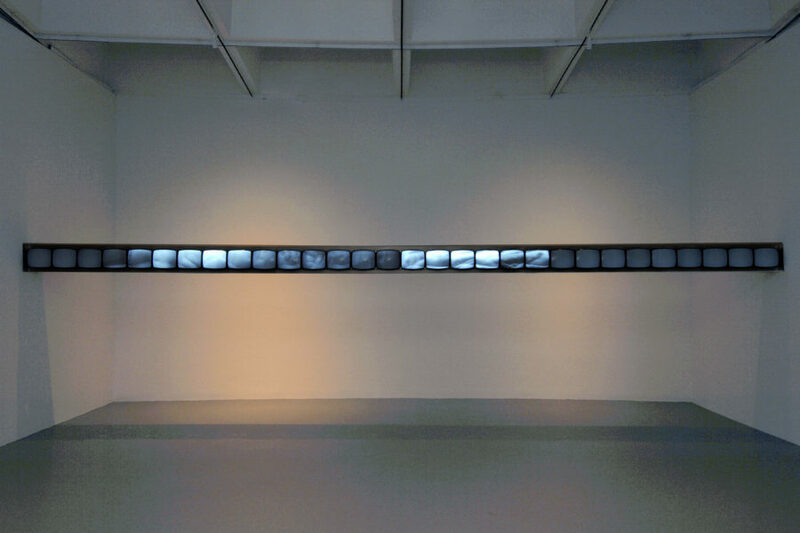 Suspension of Disbelief (for Marine) consists of thirty modified 12-inch black-and-white video monitors mounted on the face of an aluminum beam measuring 12 h. x 330 x 9 inches (30 x 836 x 23 cm.). The ends of the beam are flush and supported by the outer walls of the space. The images consist of close-up probing and scanning of the bodies of a man and a woman, segments of which flicker back and forth across the length of the beam. At times, the rapid switching of the images gives the illusion of larger areas of the body smeared across several screens. On occasion, both bodies are seen moving towards each other, overlapping one another and then breaking apart, leaving disembodied fragments in their wake. 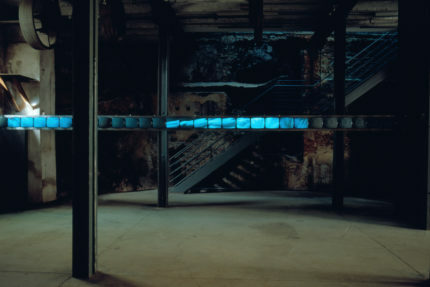 An example of this work was first exhibited at “Doubletake: Collective Memory and Current Art,” Hayward Gallery, London, England, February 20 – April 20, 1992. Travelled to: Kunsthalle Wien, Vienna, Austria, January 8 – February 28, 1993. “Gary Hill,” Le Creux de l’Enfer, Centre d’art Contemporain, Thiers, France, July 4 – September 13, 1992. “Gary Hill,” (travelling exhibition organized by the Musée national d’art moderne, Centre Georges Pompidou, Paris, France), Musée national d’art moderne, Centre Georges Pompidou, Paris, France, November 25, 1992 – January 24, 1993; Instituto Valenciano de Arte Moderno (IVAM), Centre del Carme,Valencia, Spain, February 26 – May 2, 1993; Stedelijk Museum, Amsterdam, The Netherlands, August 28 – October 10, 1993; Kunsthalle Wien, Vienna, Austria, November 17, 1993 – January 9, 1994. “Gary Hill,” (travelling exhibition organized by the Henry Art Gallery, University of Washington, Seattle, Washington), Hirshhorn Museum and Sculpture Garden, Washington, D. C., February 17 – May 8, 1994; Museum of Contemporary Art, Chicago, Illinois, September 24 – November 27, 1994; Museum of Contemporary Art, Los Angeles, California, December 19, 1994 – March 12, 1995; Guggenheim Museum SoHo, New York, New York, May 11 – August 20, 1995. “Gary Hill: Installations, vidéos,” Centre d’art contemporain de Castres, Castres, France, June 26 – August 29, 1996. 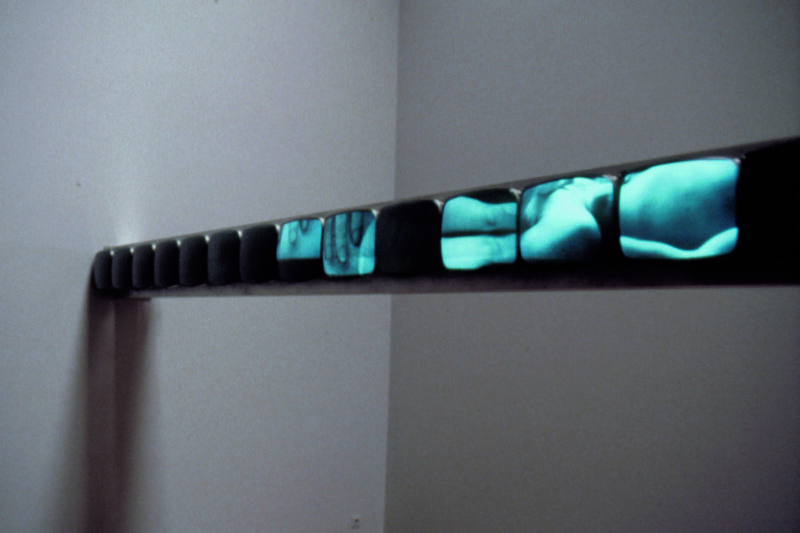 “Amours,” Fondation Cartier pour l’art contemprain, Paris, France, June 5 – November 2, 1997. “The Anagrammatical Body: The Body and Its Photographic Condition,” (travelling exhibition organized by the Neue Galerie Graz am Landesmuseum Joanneum), Zentrum für Kunst und Medientechnologie (ZKM), Karlsruhe, Germany, April 8 – June 18, 2000. “L’Empire du Temps,” Musée du Louvre, Paris, France, April 10 – July 10, 2000. 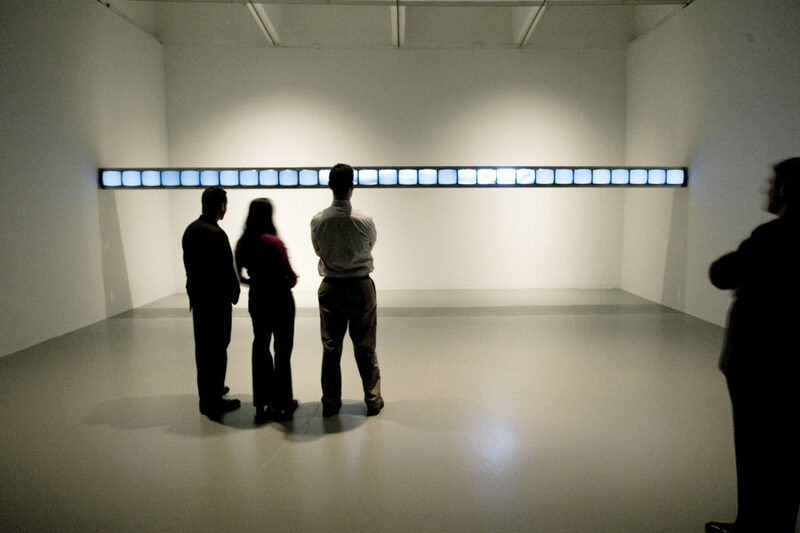 “Vidéo Topiques: Tours et retours de l’art vidéo,” Musée d’Art Moderne et Contemporain, Strasbourg, France; October 18, 2002 – February 2, 2003. “Image, Body, Text: Selected Works by Gary Hill,” San Francisco Museum of Modern Art, San Francisco, CA, March 24 – May 30, 2005. “The Cinema Effect: Illusion, Reality, and the Moving Image, Part I: Dreams,” The Hirshhorn Museum and Sculpture Garden, Washington, DC, February 13 – May 11, 2008. Watari, Shizuko. Gary Hill – I Believe It Is an Image. Tokyo: WATARI-UM, The Watari Museum of Contemporary Art, 1992, unpaginated. Sarrazin, Stephen. Chimaera Monographe No. 10 (Gary Hill). Montbéliard, France: Centre International de Création Vidéo Montbéliard, Belfort, 1992, pp. 44, 45, 82, 84. (Including excerpts from an interview with Gary Hill). Van Assche, Christine. Gary Hill. Paris: Editions du Centre Georges Pompidou, 1992, pp. 6, 26, 27, 60. Cooke, Lynne. "Gary Hill: 'Who am I but a figure of speech?'" Parkett 34 (1992), pp. 16 - 18. Barter, Ruth. "Doubletake." Art Monthly (April 1992), p. 16. Hall, Charles. "Doubletake." Arts Review (April 1992), p. 116. Morgan, Stuart. "Thanks for the Memories." Frieze (April/May 1992), pp. 9, 11. “Thiers. Suspension of Disbelief.” Flash Art (October 1992), p. 115. Fargier, Jean-Paul. “Gary Hill sur la crête des vagues.” Jardin des Modes (December 1992). Fargier, Jean-Paul. “Absences répétées.” art press 175 (December 1992), p. 65. Mignot, Dorine. Gary Hill. Amsterdam: Stedelijk Museum; Vienna: Kunsthalle Wien, 1993, pp. 77, 89 – 95. Van Assche, Christine and Corinne Diserens. Gary Hill. Valencia: Instituto Valenciano de Arte Moderno (IVAM), Centre del Carme, 1993, pp. 10, 30, 31, 64, 108, 116 – 121, 145. Jamart, Christine. “Garry Hill: ‘La Voix Iconique.’” Art et Culture, Brussels 5 (January 1993). Montolío, Celia. “Gary Hill,” Lapiz 91 (February 1993), pp. 73, 74. Barbichon, Jean-Yves. “Gary Hill: maître-mot.” NOV’Art (February 1993). Durand, Régis. “Gary Hill. Centre Georges-Pompidou Galeries contemporaines.” art press 177 (February 1993), p. 80. Muñoz, N. “El circuito americano, en Valencia.” La Cartelera (March 5, 1993), p. 4. Prats Rivelles, Rafael. “Gary Hill: imagen y sonido.” Qué y Donde (March 22 – 28, 1993), p. 6. “Exposición: Gary Hill Instalaciones Videograficas.” Periodico de la Sale de Exposiciones Rekalde 3 (March 1993). Barcott, Bruce. "Donald Young Gallery, Seattle." New Art Examiner, Chicago 20 (May 1993), p. 51. “Las creaciones de Guillermo Kuitca y Gary Hill en los espacios de Centre del Carme.” Pais Valenciano (February 26 – March 4, 1993), p. 15. Sales, Enric. “Arte de vanguardia en el IVAM.” Jano XLV, 1043 (June 4 – 10, 1993), p. 93. Grout, Catherine. "Gary Hill – La condition humaine de la pensee." Arte Factum 48 (June/July/August 1993), pp. 9, 10. Den Hartog Jager, Hans. “Droomwereld.” HP de Tijd (September 3, 1993), p. 115. Perrée, Rob. “Gary Hill: Kijken, Horen, Lezen.” Kunstbeeld (September 1993), p. 12. Cornwell, Regina. “Gary Hill Interview.” Art Monthly 170 (October 1993), p. 7 – 9. Murin, Preložil Michal. “Gary Hill.” Profil. Súcasného Výtvarného Umenia (December 1993), p. 28. De Rijcke, Elke. “Dageraad of avondschemer over de video-installaties van Gary Hill.” Metropolis M 1 (1993), pp. 27, 30. Múltiplas Dimensões/Multiple dimensions. 2 volumes. Lisbon: Centro de Cultural de Bélem, 1994, vol. 1: p. 87. Bruce, Chris. Gary Hill. Seattle, Washington: Henry Art Gallery, University of Washington, 1994, pp. 35, 72 – 79, 81, 82, 85 – 87, 89. Camper, Fred. “Split Images. Gary Hill at the Museum of Contemporary Art.” Chicago Reader (November 4, 1994), Section 1, p. 28. Hixson, Kathryn. “Gary Hill. Museum of Contemporary Art.” New Art Examiner, Chicago (November 1994), p. 40. Turkovich, Tanya. “Seeing and Being Seen: The Work of Gary Hill at the Museum of Contemporary Art.” F Newsmagazine (November 1994), pp. 23, 24. Meyers, Todd. “Consciousness and Fragmentation. Gary Hill Encountering Bodies.” Fuse Magazine 18, 3 (Spring 1995), pp. 46, 47. Duncan, Michael. “In Plato’s electronic cave.” Art in America 83, 6 (June 1995), pp. 70, 72, 73. Glueck, Grace. “Turn On, Tune In and Drop By: Video Art’s Come a Long Way.” The New York Observer (July 24, 1995). Beckmann, Angelika. “Gary Hill.” European Photography 58, 16, 2 (Fall 1995), p. 65. FremdKörper – corps étranger – Foreign Body. Basel: Museum für Gegenwartskunst, Öffentliche Kunstsammlung Basel, 1996, p. 18. Wohl & Sein. Gemeinsame Ausstellung von Basler Museen und Institutionen. Basel: Editiones Roche, 1996, p. 46. Lestocart, Louis-José. “Gary Hill: Surfer sur le medium / Surfing the Medium.” art press 210 (February 1996), p. 20. Frohne, Ursula. “Warheit des Scheins: Gary Hill: Suspension of Disbelief,” Mediagramm 11, Museum für Gegenwartskunst, Basel (April 1996), p. 8. Quasha, George and Charles Stein. Tall Ships. Gary Hill’s Projective Installations 2. Barrytown, New York: Station Hill Arts, 1997, pp. 50, 51, 54. Quasha, George and Charles Stein. Viewer. Gary Hill’s Projective Installations 3. Barrytown, New York: Station Hill Arts, 1997, pp. 77, 78. Dantas, Marcello. Gary Hill: O lugar do outro/where the other takes place. Rio de Janeiro: Magnetoscópio, 1997, p. 87. Amours. Paris: Fondation Cartier pour l’art contemporain, 1997, pp. 110, 111, 199. Fonds départmental d’art contemporain de la Seine-Sainte-Denis, Acquisitions 1994 – 1997. Bobigny, France: Conseil Général de la Seine-Sainte-Denis, 1997, p. 48. Contemporary Art: The Collection of the ZKM Center for Art and Media, Karlsruhe. Munich: Prestel, 1997, pp. 116, 117, 182. The Multimedia and Cultural Revolution. Tokyo: NTT Intercommunication Center, 1997, p. 134. Do, Willo. “Overseas Artist: Interview with Gary Hill.” Space, Japan (April 1997), p. 85. Der elektronische Raum: 15 Positionen zur Medienkunst. Bonn: Kunst- und Ausstellungshalle der Bundesrepublik Dueuschland, 1998, pp. 151, 152. TV Dinner No. 2 at The Kitchen: Gary Hill and Meg Stuart. Program notes. New York: The Kitchen, 1998, unpaginated. Morgan, Robert C., ed. Gary Hill. Baltimore: PAJ Books / The Johns Hopkins University Press, 2000, pp. 48, 87, 88, 136 – 138, 139, 141 – 143, 146, 221, 223, 228, 229, 233. Gary Hill: Instalaciones. Córdoba: Ediciones Museo Caraffa, 2000, p. 12. Lageira, Jacinto. Des premiers mots aux derniers silences in Gary Hill: Around & About: A Performative View. Paris: Éditions du Regard, 2001, p. 19. Quasha, George and Charles Stein. La performance elle-même in Gary Hill: Around & About: A Performative View. Paris: Éditions du Regard, 2001, pp. 11 – 14. Bers, Miriam. “Gary Hill: Kunstmuseum Wolfsburg.” tema celeste 90 (March / April 2002), p. 92. Gary Hill: Selected Works and catalogue raisonné. (Wolfsburg: Kunstmuseum Wolfsburg, 2002), GHCR 72, pp. 10, 11, 24, 159, 160, 186. Schnoor, Chris. “Re-Thinking the Image: Video Art by Gary Hill at Boise Art Museum.” BoiseWeekly 11, 29 (January 22 – 28, 2003), pp. 13 – 16. Barro, David. Gary Hill: Poeta da percepção, poet of perception, poeta de la percepción. In Portuguese, Spanish and English. Porto: Mimesis, 2003, pp. 16, 37, 59. Goetz, Ingvild and Stephan Urbaschek. Fast Forward: Media Art Sammlung Goetz. Munich: Sammlung Goetz, 2003, pp. 17 (photo). Shaw, Jeffrey and Peter Weibel, eds. Future Cinema: The Cinematic Imaginary after Film. Karlsruhe: ZKM and Cambridge: MIT Press, 2003, pp. 308. Schnoor, Chris. “Thinking the Image: Gary Hill at ASU Art Museum.” Shade (October / November 2003), pp. 23 – 25. Samaniego, Alberto Ruiz de. “Gary Hill and Maurice Blanchot: Dialogues at the Threshold.” Dardo magazine, 2 (June – September 2006), pp. 146 – 179. Keats, Jonathon. “The New Face of Conservation.” Art + Auction (May 2006), pp. 138 – 145 (photos). Spielmann, Yvonne. Video: The Reflexive Medium. Cambridge: The MIT Press, 2008, pp. 252 (photo only). The Cinema Effect: Illusion, Reality, and the Moving Image. Washington, DC: Hirshhorn Museum and Sculpture Garden / Giles, 2008, pp. 64 – 65. Bishop, Janet, Corey Keller and Sarah Roberts, eds. San Francisco Museum of Modern Art: 75 Years of Looking Forward. San Francisco: San Francisco Museum of Modern Art, 2009, pp. 288 – 289, 420. Quasha, George and Charles Stein. An Art of Limina: Gary Hill’s Works and Writings. Barcelona: Ediciones Polígrafa, 2009, pp. 36, 396, 407, 431, 571, 594, 648. Sterrett, Jill. “L’art en vue / Art on View.” artpress 2: Arts Technologiques - Conservation et Restauration (February/March/April 2009), pp. 60 - 64. (French and English).